In grade school, I learned about Karl Marx, and the rising up of the working class to overtake the oppressive elite. Marx’s ideas started because of a polarized social strata that separated the rich from the poor. 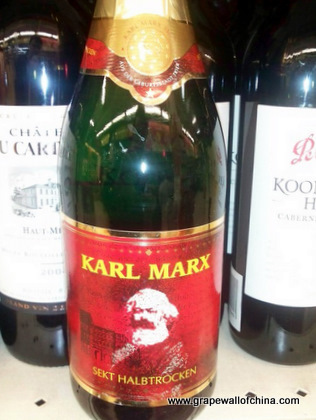 Randomly, Marx popped into my Wine Blonde head, and I began to relate the two worlds— isn’t there a polarized social strata between those who just like to drink wine and so-called wine experts? There’s no middle ground in the wine world: the real conflict is between the Wine Blondes and Wine Knows, and its time for a revolution. Let me explain. Karl Marx, the father of true communism, and author of the Communist Manifesto, fashioned two kinds of people: the Bourgeoisie (Haves) and the Proletariat (Have Nots). The Bourgeoisie owned the money, means, and businesses in a free market society. The Proletariats were the working class, controlled by the Bourgeoisie. Marx’s theory was that capitalism led the Haves to exploit the Have Nots’ labor. According to Marx, the only way to keep this exploitation from happening, was a social revolution whereby the Haves would seize political power and put all the money, means, and businesses under common ownership. Okay, so in the real world, countries tried to implement Marx’s theory, and, for the most part, it didn’t go so well. In fact, I think the only place where true communism works well is within families, and maybe in the wine world. 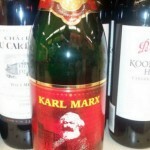 In my view, Marxism may inspire a wine revolution between two wine classes. Today, the wine struggle is between the Bourgeoisie Wine Knows and the Proletariat Wine Blondes. The Wine Knows are oppressing the Wine Blondes through wine snobbery and haughty self importance. And the Wine Blondes are suffering at the hands of these oppressors. The Wine Blondes feel inferior, uneducated, and disempowered. They walk into a grocery store and stare blankly at racks upon racks of wine bottles, with no idea which to choose. They don’t dare grab the wine list at their favorite restaurant, in fear of making a bad choice, or being over charged by a stuck-up sommelier . They “stick to cocktails” at a party because they don’t know exactly which wine to start with. The Wine Knows, on the other hand, immediately grab the wine list at the restaurant, perfectly pronounce French wine terms (although they don’t speak a lick of French), and boastfully display their wine knowledge in social settings. This leads the Wine Blondes into a quiet submission for fear of being viewed as unsophisticated. There are many examples, but I was a witness to one particular act of wine snobbery recently that fueled my resolve to support a coop in the wine world. I was having dinner at a nice sushi restaurant with a group of Wine Blonde friends, and someone invited a Wine Know. Of course, at the outset, the Wine Know sat at the head of the table, grabbed the hefty wine list, and began running her finger down the pages looking for the Chat-to-nef-du-whatever. She summons our waiter, ordered a bottle, and stylistically engaged in the presentation, corking, pouring, smelling, and tasting dance that ensues. I noticed that she ordered what appeared to be a French wine, and I was a little nervous knowing that the group may revolt against her. A couple of the Wine Blondes were brave enough to enjoy a glass with her. One by one, as they tasted the wine, their actions began to horrify the Wine Know. Arlene, the Wine Blonde sitting across from me, put an ice cube in the red wine. Paul, the Wine Blonde to my right, spit the wine back into his glass and said it tasted like dirt. And Bridgette, the queen of Wine Blondes, added a packet of white sugar and shrugged, “at least its alcoholic.” I saw the frustration and embarrassment build in the Wine Know, as each of the Wine Blondes had derogated her sacred juice. I was quietly laughing at the scene, when the Wine Know exploded. “You people know nothing about wine.” She shouted. “If your not going to enjoy it, then don’t drink it!” I could no longer hold back my restrained chuckle. Honestly, I’ve been drinking or tasting wine almost daily for 10 years and I didn’t really enjoy her wine choice. Sure, it was French. Sure, it was expensive. Sure, Robert Parker got excited about it. But that doesn’t make it good. That mindset only perpetuates the social strata: Wine Knows versus Wine Blondes. Trying to save the day, I asked what kind of fish everyone was ordering, and chose an approachable bottle of slightly fruity Pinot Noir, that even a devout apple martini drinker could palate. I reassured my Wine Blondes that this was an easier grape to drink, it didn’t taste “icky” and it would go well with their meal. The wine arrived before the nigiri, and Arlene, Paul, Bridgette, and even the Wine Know all enjoyed the Pinot Noir (sans ice cubes, sugar, or spit). Luckily the meal was saved, but the rumblings of the Wine Blonde class were clearly heard. Tis the day that Wine Blondes out number Wine Knows…and its time for a revolution where we can all drink and enjoy vino in harmony.